GlobMarble offer Decorative and Specialty concrete products, finally made a breakthrough, with the Xtreme Series Pre-Casting Bag Mix for the Concrete Countertop industry. What is this technology? 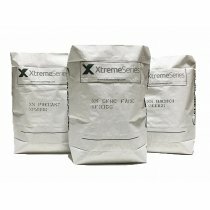 The Xtreme Series technology is a hybrid fiber reinforced concrete mix. This means that the skill set of the person looking to fabricate their own concrete countertop, shower panel, vessel sink or fireplace is not required to have years of experience. Knowledge of how to mix the concrete countertop material is ZERO, the key ingredients are pre blended in a 50 lb bag for you to use immediately. The time, money and expertise in properly reinforcing your concrete countertop with steel, wire mesh or rebar is ZERO. The Xtreme Series bag mix design incorporates PVA, Glass AR and Nano fibers that give the fabricator all the reinforcement they need without ever thinking about it. Another feature of the Xtreme Series Pre-Casting mix is that it has NO polymers and NO acrylics in its formula. Why is this important? For most of the country, they deal with temperature swings, humidity and freezing during delivery of the material. All of these factors affect how a typical concrete countertop mix performs. If your shop is 50 degrees or 85 degrees, this can cause the polymers and acrylics to act differently which can cause inconsistencies in color, workability and pinholes for most concrete countertop mixes. The Xtreme Series technology has simplified and provided solutions to these very obstacles that contractors have experienced with their current concrete countertop mix. Xtreme Fabrication Starter Kits was designed to give you everything you need to get it works. Click on the linkk below for a more information about the products included in the kit. The Xtreme Fabrication Start Kit yields 100 sq. ft of finished product. Xtreme PreCast Concrtete Countertop Mix from SureCreteXtreme PreCast - Concrete Countertop Mix it's ..
D-FRC Countertop Casting Mix From SureCreteGray ColorThis advanced fiber reinforced concrete is&nbs..
GFRC Face Mix from SureCreteGFRC Face Mix Concrete Sprayable Casting MixGFRC Face Mix is a hybrid GF..
Xtreme Countertop Terrazzo Mix XS Concrete terrazzo mix is a dual component precast concrete b..
Xtreme Series Precast Modifier is an proprietary blend of chemicals that is combined with the mixes ..
GFRC Extra Glass Fiber Reinforced Concrete Backer Mix Concrete Backer Mix is a ..